This Costa Rica tour is packed with adventure. Explore remote villages, swim in hidden waterfall pools, bump up dirt roads to accommodations deep in the jungle, zip line, river raft and go canyoning between tranquil hikes and floating in the turquoise Caribbean Sea. This trip is the perfect combination of adventure and relaxation, spiced with the people, culture and landscape you can only get in Costa Rica. Meet your driver at the San Jose International Airport to head to Bajos del Toro, about an hour and a half away. Bajos del Toro is located on the less explored western skirts of the Poas Volcano and is a thriving rural community, rich in lively traditions, unique landscapes, and spellbinding flora and fauna. Its low-key vibe and non-touristy character set the perfect stage for Costa Rica’s adventurous nature and welcoming character. Fun cultural sessions, heart-pounding thrills, and leisurely eco-discovery expeditions let visitors lose themselves in engaging experiences that are unmistakably Costa Rican. Your driver will take you directly to the hotel to check in and relax. 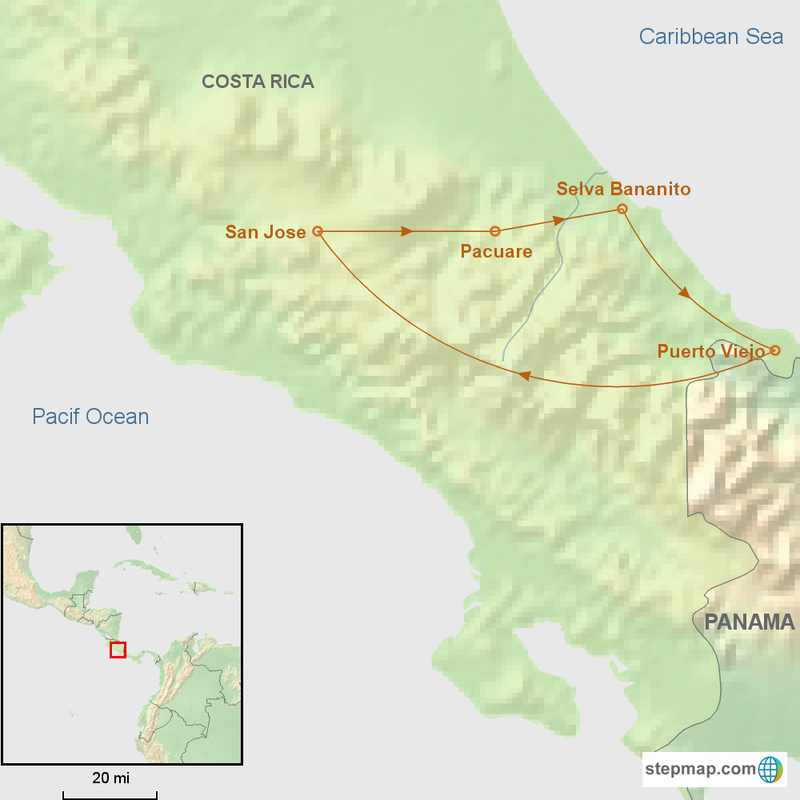 Costa Rica has a mild, tropical climate with average annual temperatures for most of the country ranging between 70°F (22°C) and 85°F (27°C), with warmer temperatures on the moderately humid coasts and cooler temperatures in the mountains and Central Valley. The coolest months are from November to January and the warmest from March through May. Traditionally, the country's climate has been divided into two major seasons: dry (December to April) and rainy (May to November); however, this description is too simplistic for the complex climate of Costa Rica, which varies locally according to elevation, location, and other topographical influences. With more than a dozen complementary climate zones, Costa Rica is a pleasant place to visit any time of year. Although rainfall patterns in Costa Rica are seasonal, they vary greatly throughout the country due to the mountain ranges that run from the northwest to the southeast and divide the nation into the Pacific and Caribbean slopes, and the central highlands. The wonderful thing about the Costa Rican rain is that it often comes later in the day, offering at least about 5 hours of daily sunshine, and when one coast receives more rain, the other coast tends to be far drier so even the "rainy" season is not what one might expect. The Pacific coast of Costa Rica is generally a few degrees warmer and less humid than its Caribbean counterpart, receiving most of its rain from May through November. The North Pacific Region is often called the "Gold Coast" due to its sunnier and much drier climate, which averages around 89°F (32°C). During the dry season, no rain may fall for several months in this microclimate. The Central Pacific is greener, due to more rainfall, and gets increasingly humid as you head south. While the Caribbean slope of Costa Rica tends to receive more rain than the Pacific coast, these showers give the coastal micro-climate more lush vegetation and less crowds. This humid coast is a bit cooler, with an average temperature of 82°F (28°C), and experiences its driest months during February and March. Annually in July and August, you can also expect the predictable, dry veranito, or little summer, to break up the green season. The Central Valley and highlands, including the capital city of San Jose, are prized for their relatively mild temperate climate, with a mean annual temperature of 70°F (22°C). The higher altitude of this area makes for the pleasant weather year round that the locals call the "eternal spring." Single supplement is the additional cost of a single traveler not sharing a room in double occupancy. A: We offer both active and cultural tours that take you from volcanoes to beaches, with all of the natural beauty, wildlife, and adventure found in between. These itineraries vary in length and level of accommodation. Our Adventure Travel Coordinators would be happy to chat with you to help you find the itinerary that best meets your needs and interests. A: Yes! We are happy to put together a custom Costa Rica tour for you if our current itineraries are not quite what you are looking for. We can also add extensions onto any of our existing tours. Q: When is the best time to go to Costa Rica? A: Costa Rica is best visited during the dry season, which runs from December to May, with the busiest times of year being around Christmas, the New Year, and Easter. A: Costa Rica’s mild, tropical climate makes it a great destination most of the year. From November to May you can expect temperatures in the low-70s to upper-80s, depending on the region you’re exploring, and little rainfall. The rainy season (May to November) offers similar temperatures with frequent afternoon rain storms. May and November are transitional months and can offer nice weather. Please see the weather tab on your specific trip for more details. Q: What is a typical day like on a Costa Rica tour? A: A typical day in Costa Rica will vary from tour to tour, but you can generally expect to start your excursions right after breakfast, with a full day of scheduled activities or sightseeing. A lunch break is included and you’ll retire to your accommodations in the late afternoon, with evenings free. Q: How physically fit do I need to be to enjoy a trip to Costa Rica? A: Our Costa Rica trips vary in level of activity, so the requirements differ based on itinerary. Please check our physical ratings for each itinerary to see what may be required of you when assessing your ability to enjoy a trip. If you have any specific questions, please contact your Adventure Travel Coordinator. We have personal experience with these activities and can help you decide whether a trip is right for you. Q: How much time do we need to visit Costa Rica? A: Most of our Costa Rica trips are between seven and 10 days, depending on how much of the country you would like to see. A: For the best guide availability and selection in hotels, we recommend booking three to six months in advance. December through April are especially popular times for Costa Rica travel, so more advance planning is ideal. For the Christmas holiday season and the week prior to Easter, we recommend booking a year in advance. A: In major cities we offer a variety of hotels including boutique properties and larger business-style hotels. Throughout the rest of the country we work with a combination of resorts, small traditional hotels, and remote lodges. The majority of the properties are family-run or locally owned. All of our accommodations are clean and comfortable, with private bathrooms and hot water. We offer basic or luxury options in many locations, depending on taste and budget. A: Eight travelers is the maximum for our Costa Rica trips, but the majority of our departures are private. What Makes Costa Rica So Different?